Food, no matter of what kind, is a substance required for survival. Stripped of any cultural meanings, it is a primary means of biological nourishment and sustenance. But in a cultural context, the types of food, how they are eaten, what social rituals are involved in etiquette, and so on, take on a greater value. In other words, outside of a survival context, food is much more than substance for ensuring such survival. It constitutes a meaning system imbued with subtle unconscious cultural connotations of all kinds. We eat, first and foremost, to survive. But in a social ambiance, food takes on significance that transcends this biological function, affecting even our perceptions of edibility. In America, we do not normally eat insects, by and large, even though they would provide nourishment. We do not eat them because of the negative perceptions and emotions we have projected onto insects. In other cultures, insects are often considered to be a delicacy. Clearly, food tastes are cultural tastes. So, where does the fast food phenomenon fit into this line of reasoning, given that it seems to go against historically-based cultural systems of meaning? This book will attempt to answer this question by examining the origin, evolution and meanings of the fast food phenomenon, from its neurological and social meanings to its recreational ones. Does the contemporary penchant for fast food exist in the brain, or is it a fabrication of a consumerist culture gone insane, as the movie The Gods Must Be Crazy so eloquently and satirically emphasized? Much has been written about the phenomenon of fast food, given the importance of eating to health and cultural identity. 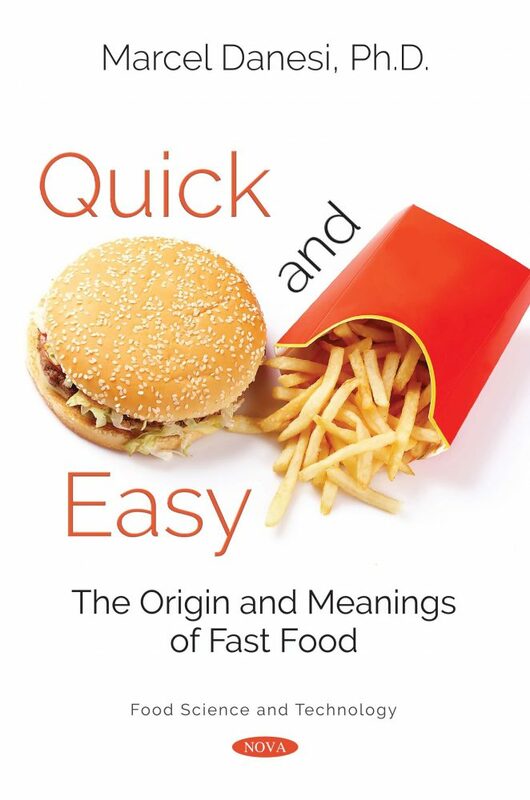 The goal in this book is to go in a slightly different, but hopefully significant, direction; namely, to examine the meanings of fast food in relation to the birth and spread of mass consumerist society, and its role in future societies. Fast food originated in amusement and circus culture, but it soon spread to society via urbanization, the automobile, and the need for “quick and easy” solutions to almost everything, including the preparation and eating of food. The book argues that, in the end, we are what we have made ourselves to be. Fast food is of our own making, not something imposed cleverly by some master capitalist plan. We eat it because it is tasty and easily prepared. The cultural meanings of fast food might even be intertwined with an innate pleasure principle, into which fast foods seem to tap rather effectively. Above all else, fast food is a mirror of the contemporary world’s penchant for a quick-and-easy approach to virtually everything, for better or worse. Given its proliferation to all sectors and levels of society, fast food has changed the social paradigm of eating everywhere. The book will conclude by assessing what the implications of this paradigm for the future are. Theodor Adorno, Aesthetic theory (Minneapolis: University of Minnesota Press, 1970). See, for example, Harvey Levenstein, Paradox of plenty: A social history of eating in modern America (Oxford: Oxford University Press, 1993); Eric Schlosser, Fast food nation (Boston: Houghton Mifflin, 2000); Morgan Spurlock, Don’t eat this book: Fast food and the supersizing of America. (New York: Berkley, 2006); and Andrew F. Smith, Fast food & junk food: An encyclopedia of what we love to eat (Santa Barbara: Greenwood, 2012). Linda Civitello, Culture and cuisine: A history of food and people (New York: Wiley, 2004). Maguelonne Touissant-Samat, A history of food (New York: Wiley-Blackwell, 2008). There are many other books that deal with the same topic, including Tom Standage, An edible history of humanity (London: Bloomsbury, 2009); Paul Freedman, Food: The history of taste (London: Thames & Hudson, 2012); Bee Wilson, Consider the fork: A history of how we cook and eat (New York: Basic Books, 2013); and Rachel Laudan, Cuisine and empire: Cooking in world history (Berkeley: University of California Press, 2015). See, for example, Karen Bescherer Metheny and Mary C. Beaudry, eds., Archeology of food: An encyclopedia (Lanham: Rowman & Littlefield, 2015). See, for example, Charles L. Redman, The rise of civilization: From early farmers to early society in the ancient Near East (San Francisco: W. H. Freeman, 1979). Claude Lévi-Strauss, The raw and the cooked (London: Cape, 1964). A fascinating history of the meanings of the rabbit is the one by Susan Davis and Margo DeMello, Stories rabbits tell: A natural and cultural history of a misunderstood creature (New York: Lantern Books, 2003). Sara Coven Juengst, Breaking bread: The spiritual significance of food (Westminster: John Knox, 1992). Margaret Visser, The rituals of dinner (New York: Harper Collins, 1991), 2—3. Mircea Eliade, A history of religious ideas (Chicago: University of Chicago Press, 1972). See Mikhail Bakhtin, Speech genres and other late essays (Austin: University of Texas Press, 1986). Julie Hayden, Knife, fork and spoon: The history of table manners (Amazon Digital Services, 2011). Judith Goode, “Food,” in Folklore, cultural performances, and popular entertainments, edited by Richard Bauman, 233-245 (Oxford: Oxford University Press, 1992). Visser, The rituals of dinner, op. cit., 107. Cited in The history of foods in 101 objects (New York: Media Lab Book, 2017), 5. Marshall McLuhan, The mechanical bride: Folklore of industrial man (New York: Vanguard, 1951); The Gutenberg galaxy: The making of typographic man (Toronto: University of Toronto Press, 1962); and Understanding media: The extensions of man (Cambridge: MIT Press, 1964). Marshall McLuhan, The Agenbite of Outwit, published posthumously in McLuhan Studies, Volume 1, Issue 2, 1998, 23. Roland Barthes, Mythologies (Paris: Seuil, 1957). Jürgen Habermas, The philosophical discourses of modernity. Cambridge: MIT Press, 1987). Derrick de Kerckhove, Connecting intelligence. http://www.media-studies.ca/articles/derrick.htm, posted 2015. Herbert Marcuse, One-dimensional man (New York: Beacon Press, 1964), 18. Chapter 2	Proclamation of Thanksgiving, October 3, 1864, by Abraham Lincoln, Online. Cited in James B. Twitchell, Twenty ads that shook the world (New York: Crown, 2000), 8. Arthur Asa Berger, Shop ‘til you drop: Consumer behavior and American culture (Lanham: Rowman & Littlefield, 2005). Max Weber, The Protestant ethic and the spirit of capitalism (New York: Scribner’s, 1958). Berger, Shop ‘til you drop, 6. Andrew F. Smith, Food and drink in American history: A “full course” encyclopedia (Santa Barbara: ABC-CLIO, 2013), 195. Mikhail Bakhtin, Rabelais and his world (Bloomington: Indiana University Press, 1993). A good history of the amusement park is the one by Judith A. Adams, The American amusement park industry: A history of technology and thrills (New York: Twayne Publishers, 1991). Dale Samuelson and Wendy Yegoiants, The American amusement park (Minneapolis: MBI Publishing, 2001). Linda M. Scott, Fresh lipstick: Redressing fashion and feminism (New York: Palgrave, 2005), 167. Frank R. Leavis, The great tradition (New York: Chatto & Windus, 1948). A good history of the sandwich is the one by Bee Wilson, Sandwich: A global history (London: Reaktion Books, 2010). Solomon H. Katz and William Woys Weaver, Encyclopedia of food and culture (New York: Charles Scribner's Sons, 2003), Volume 3, 235-6. Hans D. Renner, The origin of food habits (London: Faber and Faber, 1944), 223-4. “Sandwiches flourishing,” New York Times, November 2, 1924. Cited in The history of foods in 101 objects (New York: Media Lab Book, 2017), 86. A good history of the donut is the one by Heather Delancey Hunwick, Doughnut: A global history (London: reaction Books, 2015). Cited in Sky Dylan-Robbins, “Handcrafting doughnuts at dough,” The New Yorker, June 7, 2013. Martha Esposito, Shea, and Mike Mathis, Images of America: Campbell Soup Company (Mount Pleasant, SC: Arcadia Publishing, 2002). Jane Stern and Michael Stern, Encyclopedia of pop culture (New York: Harper, 1992), 123. Cited in Candice Russell, “Cooking up passion,” Sun Sentinel, 1993. http://articles.sun-sentinel.com/1993-04-25/features/9302080180_1_almonds-and-sesame-turkey-mole-laura-esquivel. Max Weber, The Protestant ethic and the spirit of capitalism (London: Unwin Hyman, 1905). John B. Watson, Behaviorism (New York: Norton, 1925); and Psychology from the standpoint of a behaviorist (Philadelphia: Lippincott, 1929). Ivan Pavlov, The work of digestive glands (London: Griffin, 1902). B. F. Skinner, The behavior of organisms (New York: Appleton–Century–Crofts, 1938). B. R. Andrews, “Habit,” The American Journal of Psychology 14 (1903): 121-49. Steven Johnson, Everything bad is good for you: How today’s popular culture is actually making us smarter (New York: Riverside, 2005). Pierre Bourdieu, Outline of a theory of practice (Cambridge: Cambridge University Press, 1977). Marcel Mauss, Les techniques du corp, Journal de Psychologie. [Journal of Psychology]. 32 (1934): 3-4. Martin Joos, The five clocks of English (New York: Harcourt, Brace and World, 1967). Julia Woodhall-Melnyk and Flora I. Matheson, “More than convenience: The role of habitus in understanding the food choices of fast food workers,” Work, Employment, and Society 31 (2017): 800-15. Thomas Frank, The conquest of cool (Chicago: University of Chicago Press, 1997) and One market under God: Extreme capitalism, market populism, and the end of democracy (New York: Anchor Books, 2002); Naomi Klein, No logo: Taking aim at the brand bullies (Toronto: Alfred A. Knopf, 2000). Stuart Ewen, All consuming images (New York: Basic Books, 1988), 20. Alan Bryman, The Disneyization of society (London: Sage, 2004). Bryman, The Disneyization of society, 25-26. Eric Schlosser, Fast food nation (Boston: Houghton Mifflin 2001), 34. Ray Raphael, Founding myths: Stories that hide our patriotic past (New York: The New Press, 2014). Emile Durkheim, The elementary forms of religious life (New York: Collier, 1912). Sandra Oliver, Food in colonial and federal America (Westport, CT: Greenwood Press, 2005). Katharine E. Harbury, Colonial Virginia’s cooking dynasty (Columbia, SC: University of South Carolina Press, 2004). Jane Carson, Colonial Virginia cookery (Williamsburg, VA: Colonial Williamsburg Foundation, 1974). Henry Wansey, The journal of an excursion to the United States in North America in the summer of 1794 (Salisbury: J. Easton, 1796), 46. Cited in Charles Woodmason, The Carolina backcountry on the eve of the Revolution: The journal and other writings of Charles Woodmason, Anglican itinerant (Chapel Hill: University of North Carolina Press, 1953), 36. Hannah Glasse, The art of cookery made plain and easy (London: Prospect Books, 1747), 137. John Bartram, Travels in Pensilvania and Canada (Ann Arbor: University Microfilms, 1751), 71. Recall Roland Barthes, Mythologies (Paris: Seuil, 1957). See Nak-Eon Choi and Jung H. Han, How flavor works: The science of taste and aroma (Hoboken: Wiley, 2013), 208. Andrew F. Smith, Fast food & junk food: An encyclopedia of what we love to eat (Santa Barbara: Greenwood, 2012), x.
	Stanley Feldman and Vincent Marks Public nation: Unpicking the myths we’re told about food and health (London: John Blake Publishing, 2015). David M. Buss, Evolutionary psychology: The new science of the mind (Boston: Pearson, 2004). The starting point for meme theory is Richard Dawkins’, The selfish gene (Oxford: Oxford University Press. 1976). E. O. Wilson, On human nature (New York: Bantam, 1979). E. O. Wilson and M. Harris, “Heredity versus culture: A debate. In Anthropological realities: Readings in the science of culture, edited by J. Guillemin, 450-465 (New Brunswick, NJ: Transaction Books, 1984), 464. Michel Foucault, The archeology of knowledge (New York: Pantheon, 1972). A. P. Gladstone et al., “Fasting biases brain reward systems towards high-calorie foods,” European Journal of Neuroscience 30 (2009): 1625-35. Karl Marx, Capital (London: Penguin Classics, 1990). Sigmund Freud, Miscellaneous papers, 1888-1938, volume 5 of Collected papers (London: Hogarth and Institute of Psycho-Analysis, 1924-1950), 198-204. Lev S. Vygotsky, Thought and language (Cambridge, Mass. : MIT Press, 1962). Barry Hoffman, The fine art of advertising (New York: Stewart, Tabori & Chang, 2002), 6. Mary Douglas, Food in the social order: Studies of food and festivities in three American communities (New York: Russell Sage Foundation, 1984); Grant McCracken, Culture and consumption (Bloomington: Indiana University Press, 1988); Adrienne Lehrer, “As American as apple pie—and sushi and bagels: The semiotics of food and drink,” in Recent developments in theory and practice: The semiotic web 1990, edited by Thomas A. Sebeok and Jean Umiker-Sebeok, 391-401 (Berlin: Mouton de Gruyter, 1991); Sidney W. Mintz, Tasting food, tasting freedom: Excursions into eating, culture, and the past (Boston: Beacon, 1996); Melissa Caldwell, “Domesticating the French fry: McDonald’s and consumerism in Moscow, Journal of Consumer Culture 4 (2004): 5-26; and Simona Stano, Eating the other: A semiotic approach to the translation of the culinary code (Turin: Università degli Studi di Torino, 2014). Warren Belasco, Appetite for change: How the counterculture took on the food industry 1966-1988 (New York: Pantheon Books, 1989). Marcel Danesi, “A note on the meanings of junk food,” Semiotica 211 (2016): 127-37. Susan Sontag, Illness as metaphor (New York: Farrar, Straus & Giroux, 1978). Jacalyn Duffin, Disease concepts in history (Toronto: University of Toronto Press, 2005). John Kenneth Galbraith, “The dependence effect,” in The consumer society reader, edited by Juliet Schor and Holt (New York: The New Press, 2000), 21. Kalle Lasn, Culture jam: The uncooling of America (New York: Morrow, 2000).